Renku is a form of collaborative linked verse poetry, with the emphasis on collaboration. 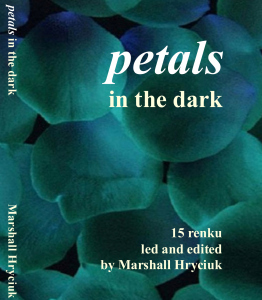 Fifteen from renku master Marshall Hryciuk are included here. What was the selection process for this book? How were these poems chosen? How many more poems are there? Based on the quality here, we can only hope for a sequel. Between the notes & the poems, I am left wishing I had been present & contributing to every one of them. Some of these poems were composed in person & some by email, in various locations around the world, as part of haiku conferences, & other groups of people – including both well-known poets & some participants who had never written poetry before. Hryciuk has included, at the beginning of the book, several pages about linked poetry – an introduction to some of the terms & what he means by them (like waka & kigo); his encouragement & instructions to renku participants – especially to trust their intuition (“quality listening and uninhibited perception”); examples from Basho, to illustrate the best & also the rule-breaking, & how reading two stanzas of a renku together is how “to best appreciate how a five-line poem can cast light gently back and shadow forwards”; & how the experience of renku can improve a poet. In this collection, he has shown how “the energy of renku lies in responding to poetry with poetry”. With humour & patience, & with amazing results, Hryciuk asks his renku participants to commit poetry – just do it!